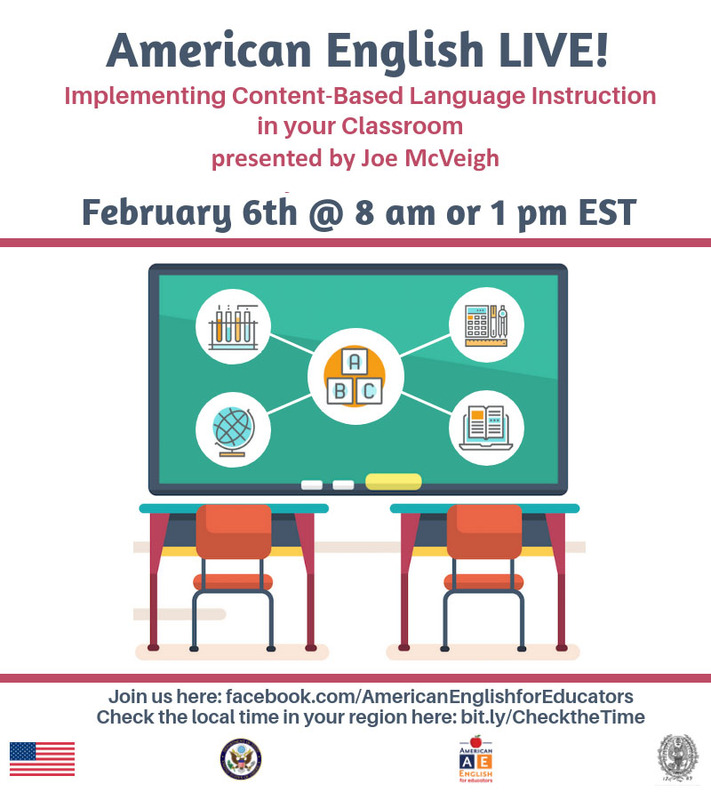 If you are free next Wednesday, February 6th, please join me for a webinar on the basics of content-based language teaching. This series, sponsored by the English Language Programs of the U. S. State Department, is intended for EFL teachers around the world, many of whom may have limited resources and exposure to the basic concepts of content-based instruction. So the presentation may be on the easy side for those of you who are already engaged in this kind of teaching. But take a look at the description below and do join me if your time permits. Please spread the word to colleagues who might be interested, especially those in EFL contexts. The webinar can be seen on the American English for Educators Facebook page. That page looks static if you visit it now, but the webinar will go live on that page at 8 a.m. EST and again at 1 p.m. EST. This webinar will focus on the needs of teachers using content-based language instruction in the classroom. Participants will learn basic concepts and examine methods to connect and integrate content learning and language instruction. We will look at sample materials and tasks for the classroom and consider how best to structure lessons. We will discuss methods for simplifying content to make difficult ideas easier to understand. We will also focus on the need for attention to subject-specific academic vocabulary. Finally we will look briefly at different models for assessing student work.